After designing cell phones for a few years, I decided that I didn’t want to spend decades alone in a cubicle, so I went back to school for my MBA. I happened to meet some Enova representatives at a Chicago Booth on-site event, came in for some interviews, and have been here ever since. I started out on the UK Strategy & Operations team, before switching over to UK Marketing when the opportunity arose. I’ve worked on SMS, email, direct mail, the mobile app and general retention marketing for the past couple years. 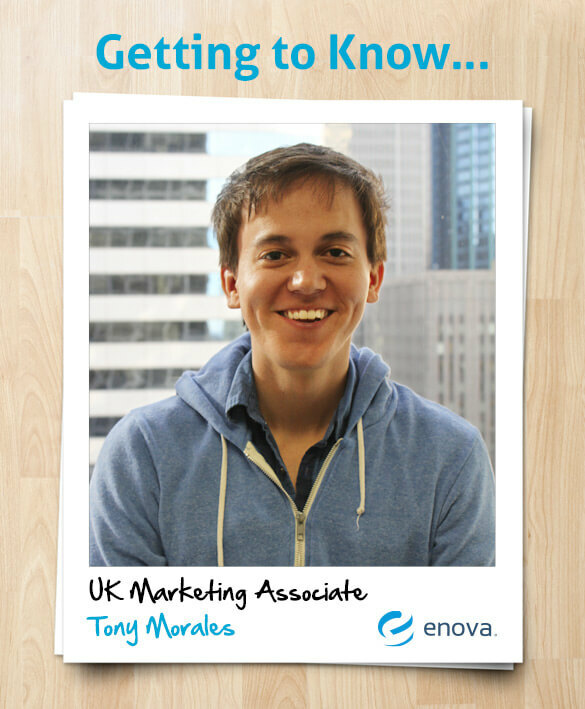 Recently I joined the corporate development team, which means that, moving forward, I’ll be adding PPC, SEO and product launch experience to my Enova repertoire. 3. What’s the best part of working here? The people. Everybody here is so intelligent and down to earth. I’d do my best to split time between Dublin, Chicago and any beach where the surfing is good for people who have no idea how to surf. A solar-rechargeable e-reader loaded with a few thousand books, a lifetime supply of mac and cheese, and a pair of glasses, because I’m legally blind.